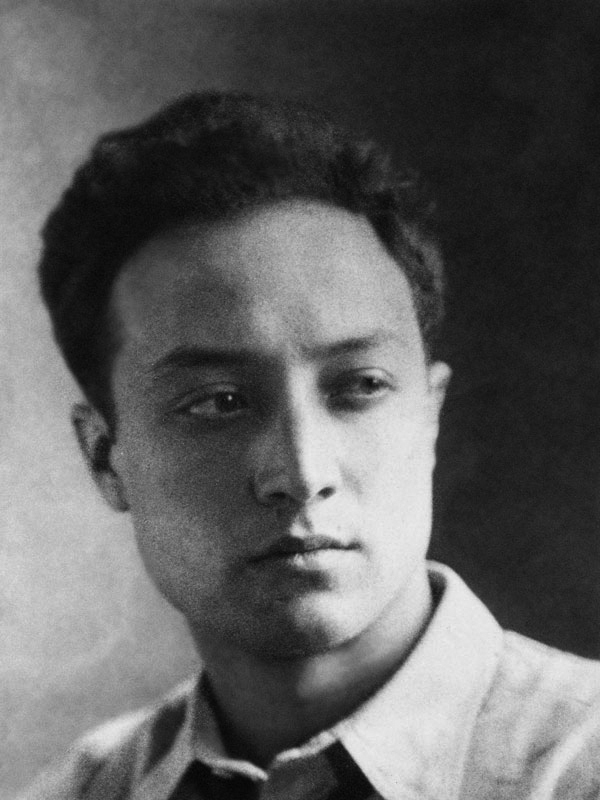 Isamu Noguchi was the son of Yone Noguchi, a Japanese poet, and Léonie Gilmour, an American writer. He was born in Los Angeles in 1904 but lived in Japan from the age of two until 1918 when he returned to the United States to attend school in Indiana. In 1922 Noguchi moved to New York to study pre-medicine at Columbia University. He also took night courses in sculpture with Onorio Ruotolo and soon after, he left Columbia in pursuit of a career in the arts. In 1927 Noguchi received a Guggenheim Fellowship for a trip to Paris and the Far East. For six months in Paris, he worked in the studio of Constantin Brancusi and his own work became more abstract as Noguchi explored working with stone, wood and sheet metal. Noguchi returned to New York and in 1929 he met R. Buckminster Fuller and Martha Graham, colleagues and friends with whom he would later collaborate. In 1938 Noguchi was commissioned to complete a work for the Associated Press building in the Rockefeller Center in New York. Marking his first public sculpture, this work garnered attention and recognition for the artist in the United States. After the Japanese attack on Pearl Harbor, Noguchi became politically involved. He started Nisei Writers and Artists Mobilization for Democracy, a group dedicated to raising awareness of the patriotism of Japanese Americans, and he volunteered to be placed in an Arizona internment camp where he resided for seven months. Following the war, he spent time in Japan exploring the issues highlighted by the conflict of war; the experiences culminating in sculptural works that were included in the exhibition Fourteen Americans hosted by the Museum of Modern Art in New York in 1946. Noguchi traveled throughout his lifetime and was inspired by experiences, artists and techniques around the world. Never confined by material or a particular movement, Noguchi’s aesthetic accomplishments covered a broad range including sculpture, furniture and lighting design, parks, gardens, theater and more. His first retrospective was held at the Whitney Museum of American Art in 1968. He received multiple accolades and awards during his lifetime and in 1986 he represented the United States at the Venice Biennale. A testament to his commitment to public spaces, in 1985 Noguchi opened The Isamu Noguchi Garden Museum in Long Island City, New York (now known as The Noguchi Museum) and today his legacy lives on through the museum’s work. Noguchi died in 1988 at the age of eighty-four.